With all the talk of red meat being bad for you, I try to create meals where I’m not serving just a steak as the main dish, but creating a new dish that has less meat and more nutrients. This one uses thin sliced sirloin, or you can use flank steak or other thin cut steak. You’ll need to slice these into three inch strips to create the perfect container for Julienne cut vegetables. The crowning glory of this recipe that makes it taste so yummy is from marinating the meat first for an hour or two in Worcestershire sauce, salt and pepper and topping it with a balsamic glaze. 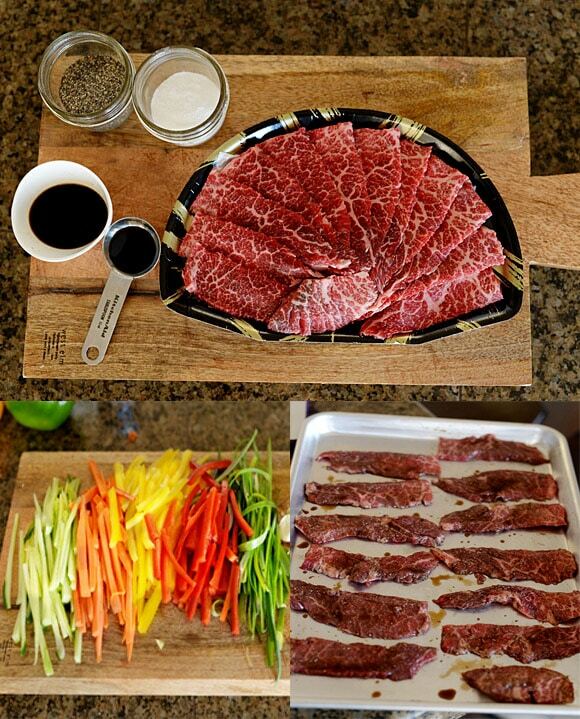 You can save time by cutting the steaks and julienning the vegetables ahead of time, if you want. 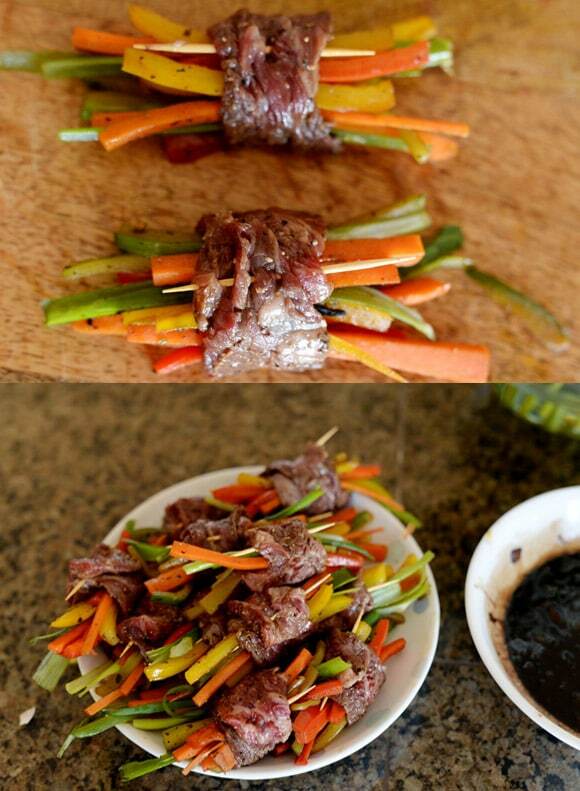 You’ll want the veggies slightly longer than the width of the steak strips. I use a mandolin slicer for these, but some people are quite adept at slicing veggies matchstick thin without one. You can use almost any vegetable. Carrots, zucchini, green onions, bell pepper or any other veggie combination can be used. Before I put them in the meat rolls, I quickly seer them for a few minutes to precook them a bit. I toss in crushed garlic when doing this for even more flavor. If you’re using green onions, there’s no need to precook these. 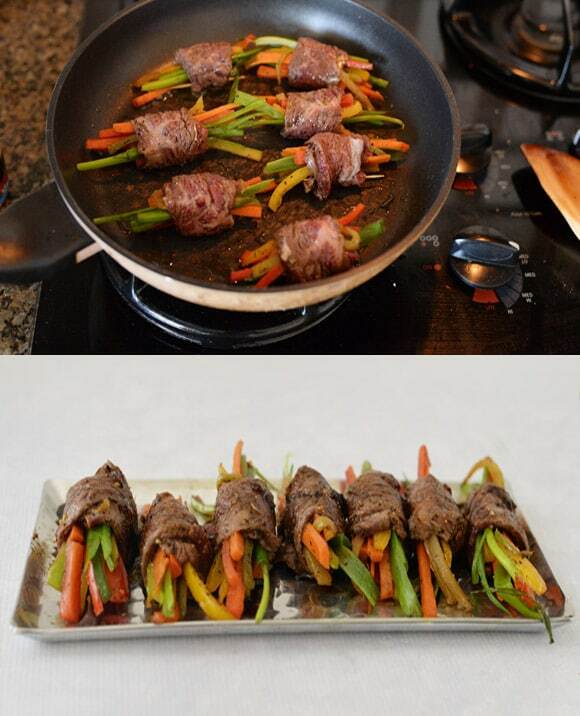 Put the veggies on a steak strip and roll it up, securing it with a toothpick. The veggies will extend beyond the steak at each side. Heat a small amount of oil in a pan and fry the steak rolls, starting with the seam side down when you do. The sauce is made from balsamic vinegar, brown sugar, beef stock, butter and shallots. You’ll melt the butter first and lightly sauté the chopped shallots. Add the rest of the ingredients and bring to boiling, consistently stirring it until it boils down to half the volume and is a syrup like consistency. 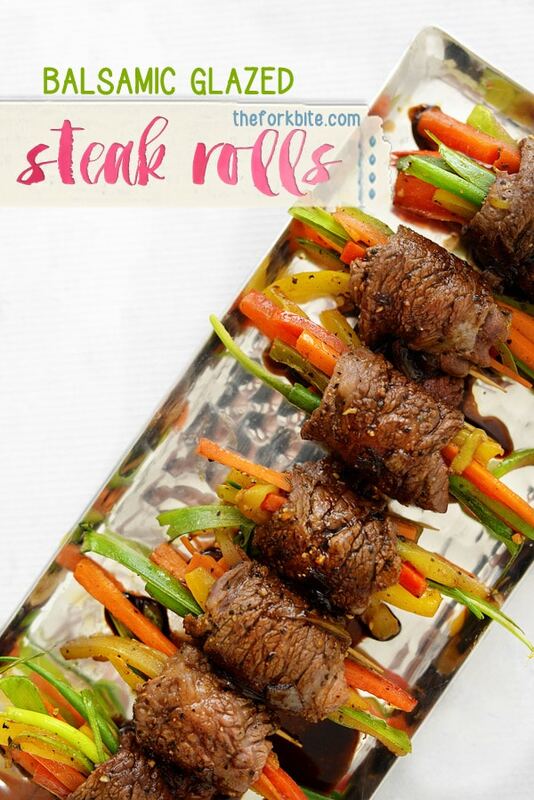 Serve the sauce over the steak rolls and you’ll have your family eagerly cleaning their plate, veggies and all. No one will notice they had far more vegetables and less meat than normal, making it healthier and easier on your budget. Because they look very fancy and taste delicious, like a meal in a fine restaurant, you won’t hear anyone complaining there’s not enough meat. I love using this recipe to clean out the vegetable bin. You can use almost any vegetable and it still tastes delicious. Create a meal where you're not serving just a steak as the main dish, but creating a new dish that has less meat and more nutrients. Prepare the steak by trimming some of the fats. You can then tenderize the meat with a meat hammer (if you’re using sirloin it doesn’t need any tenderizing). Season the steak pieces generously on both sides with salt, pepper and worcestershire sauce. And let them sit in the marinade for at least 30 mins if not a couple hours. Add the finely chopped shallot and sautee it for a minute or 2 until they turn soft and translucent. Season them with the the Italian herb seasoning and salt and transfer the veggies to a bowl.